I started this Kickstarter on July 18, 2012 and it will end on August 17, 2012. 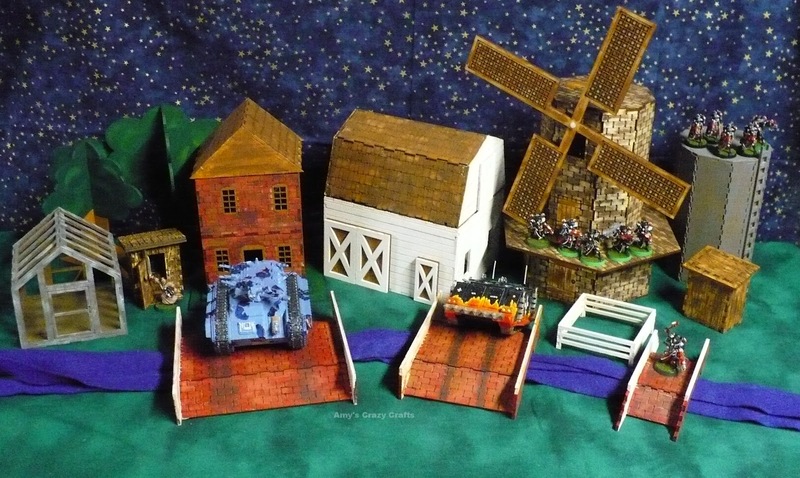 This Kickstarter is for the design of wargame terrain sized for 28mm scaled models. This is my first set for mass production, a farm themed set. I try to design nice looking pieces that are easy to paint and use. If this Kickstarter is successful, I hope to begin design work on additional themed sets and custom pieces. I already have a laser cutter/engraver, so the funding will go toward software, upgrades, materials (for rewards and more prototypes) and the shipping and handling (postage, shipping boxes, envelopes, packing materials, etc) of the reward level items. I find stretch goals to be fun! So tell your friends! Stretch goals will be for pledges $75 or above. Figure not included for size reference only. Joke Objective: Both commanders have to GO! Last army holding the outhouse wins! I will assemble and paint this set just for you! Then lovely package and ship it to you so you can use this right away! This will all be done in plenty of time for Christmas! I will also assemble and paint any stretch goals that are met! I will need to know some info before painting this wonderful set for you. 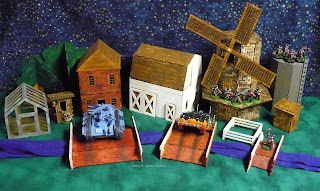 Let me know what color brick you would like on the bridges, farmhouse and windmill. (Brown, red, mix of brown and red brick, artist's choice) What color to paint the barn siding. I will paint all the wood, wood colored unless told otherwise. The greenhouse will be a gray and tan unless asked for a different color. I will need to know what color to paint the inside of the house (walls & floor), barn main floor and loft inside of the roof. The fence will be painted white unless otherwise directed. Also will need to know how you would like the bridges painted, like they were just built or lovely used (like in the picture). Sorry, about the high shipping costs but to package this set so it will not get damaged in shipment there is no way to put it into one (or two) flat rate boxes. I was not going to offer this reward because of the high shipping costs but was asked to. All the items will be shipped unfinished and unassembled, they should be sanded with 220 grit sand paper for a smooth finish. I like the rougher look so I just paint mine without sanding. The material I normally use is Baltic Birch which glues together wonderfully with superglue, Elmer's glue or normal wood glue. I prefer Elmer's Clear glue. Example of how pieces will be packaged. Since most people do not read or look at the instructions there will only be notes to be aware of if we find a certain part hard to put together. I am looking into the possibility of making assembly videos, but most of the items are very easy to assemble.